March Favourites! | Becky Alyssa's Beauty Box. Happy Spring! I hope you’ve been enjoying our first few days of sunshine and warmer weather. I’m off to Amsterdam very soon, so I’m sharing my favourite products for March with you before I disappear! 1. PINK Wild & Breezy Body Mist ($18 via victoriassecret.com) – I’m currently hooked on body mists – easy to wear and perfect for those days where you want to wear a subtle scent but don’t want to be distracted by the smell of your perfume all day, however lovely it might be. I’ve been at home doing uni work most days, so a light body mist is all I really need. I picked this up at the Victoria’s Secret store on London on offer, looking for something a little different from my usual choices, and fresh for Spring..and so far I love it. The main notes are “red guava and passion flower”..doesn’t that sound delicious? Not to mention, the bottles are huge so they’ll last for ages. Tempted to pick up a few other scents when I next visit. 2. Lush Rose Jam Shower Gel (limited edition, no longer available) – Isn’t it funny how our scent tastes change over time? I never used to be a rose person, but here we are. This was a limited edition Lush product from over Christmas, so sadly it’s not available all year round. Everyone seems to go nuts over the sickly-sweet Snow Fairy over the festive season, but Rose Jam is where it’s at for me. Fingers crossed it’ll be back this year! It is said to contain “Turkish Rose Absolute and geranium oil”, a truly divine, luxurious scent for your everyday showering. I feel fancy every time I use it. 3. Essie ‘A Splash of Grenadine’ Nail Polish (£7.99 via Superdrug) – The shade I’ve been wearing non-stop all month – it’s rare I’m ever that into one shade! I was obsessed with YSL’s pricey ‘Rose Scabiosa’ polish; although this isn’t an exact dupe or anything, it’s still in there with the vibrant creamy pink-purple family. Perfect for that boost of happiness during the chilly weather – how can you ever be unhappy with gorgeous fuschia nails?! I can’t fault the Essie formula either – I rarely pay more than a few pounds for one polish, but it wears incredibly well and the application is flawless and gorgeous. Always worth the money, even coming from a mega-cheapskate like me. 4. MAC Pro Longwear Paint Pot in Groundwork (£15 via Debenhams) – It all started with Maybelline Colour Tattoos and now I’ve well and truly fallen for cream eyeshadows. As much as I love my colour-coordinating palettes featuring countless combinations of looks, there is so much to be said for a good cream formula. Groundwork is a warm neutral brown, ideal for a wash of colour over the lid on a lazier makeup day, with a darker brown in the crease and maybe even a highlight if you’re feeling adventurous. The formula wears for hours and I have no problem wearing it all day – no sign of creasing whatsoever. The only annoyance is that these are £15 each! I actually find the Maybelline formula creamier and easy to apply, but MAC have by far the most stunning range of colours. They seem a little expensive to have more than a handful in my collection, which is a shame! 5. Tarte Amazonian Clay Full Coverage Foundation (£32 via QVC UK) – I have far too many good things to say about this foundation! Everything from the ultra-smooth application, to the perfect coverage and finish. Not to mention the wear time – lasting through most of the day, even on oily skin, isn’t a problem. And did I mention that Ivory is the perfect shade for paler NW15-20 skin? I find so many foundations come up orange, or cling to dry skin/fine hairs, or turn me into a shiny glowing beacon of oiliness. It’s interesting to see that Tarte have tentatively started selling a selection of their products via QVC UK (I’ve no idea why, does anyone even buy from QVC anymore? It’s really not somewhere I’d want to buy my makeup from, but there you go) and luckily this one made the cut. Mine was bought from the US so although it was much cheaper, it didn’t come with the super-soft brush featured in the linked product. I have no problem just using my fingers to apply with no brush at all, the finish is still lovely. I’d say this would be a suit-all foundation for any skin type – if it works for my difficult skin, I can’t see anyone being disappointed with it! 6. Maybelline Color Elixir in Rose Redefined ($8.09 via Drugstore.com) – Another US buy that I’m in love with – I chose well for my ultra-selective Beauty.com haul since I’ve loved everything! I’d heard a lot about these from other beauty bloggers, praising this formula as perfection. I already own far too many lip products, so I was skeptical this would be any kind of life-changing item. Okay, maybe not life-changing, but it’s definitely a must-have lip product that everyone should have in their collection. ‘Rose Redefined’ is a very safe, neutral rosy pink – I didn’t want to choose anything too crazy and risk wasting my money. The formula is ultra-smooth, sweet-smelling (none of this old lady scented business) and non-sticky, with a gorgeous glossy finish. I rarely wear gloss for fear of getting my hair catastrophically stuck over my face in a sticky mess and thus looking an absolute state, but this is so wearable and pretty. Ideal to finish off a ‘fresh’ spring look, if you’re looking to step away from the darker plum and berry shades of winter already, but don’t want the mess and stickiness of your typical gloss. Is it okay to mention candles on a beauty-based blog? I feel like they’re always thrown in there with makeup collections – Laura Mercier, Jo Malone, etc, for example. I’m somewhat obsessed with the scents from Bath & Body Works, I feel like 90% of them were just made for me and I honestly can’t get enough – the concentrated scents, great throw and cute jars keep bringing me back. I tracked mine down on Ebay for a reasonable(ish) price, since of course they’re unavailable in the UK. 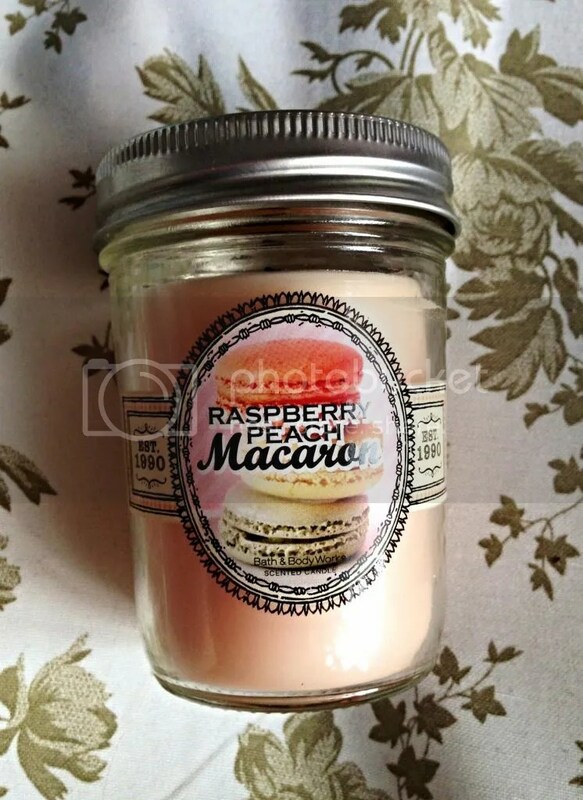 Raspberry Peach Macaron is from B&BW’s ‘Sweet Shop’ collection for Spring – a mix of “ripe raspberries, juicy peach and almond cream”. This sweet fruity-almond mix is perfection and I genuinely can’t get enough of it! I wish these were more easily available, since I’ll be sad to run out. At least I can use the adorable jar as a brush holder afterwards. I hope you enjoyed my favourites for this month! What have you been loving over March? And what are you planning to buy during April? Let me know! I have NOT seen that candle in B&BW at all! Holy cow that sounds like it smells damn good. I’m going to be on the lookout for that one.